The First International Exhibition of Modern Decorative Art was held in Turin from May to November 1902. The 'Scottish Section', a suite of three rooms, including display cases, was designed by Mackintosh. In addition, one of these three rooms was dedicated to his and Margaret Macdonald's work; in one half of the space they created the room setting 'The Rose Boudoir'. In all three rooms Mackintosh fitted white-painted woodwork, which further contained and subdivided the existing spaces. He applied picture rails approximately seven feet (2.13 m) above the floor, and above this level painted the walls and ceilings white. He covered the large windows with light fabric to diffuse the sunlight. Vertical batons divided walls into sections framing specific artworks. Short wooden screens matching the height of the picture rails were inserted at the sides of the two room settings. Those in the Mackintoshes' room consisted of solid panels inlaid with stained glass; in the McNairs' room they had an open, geometric structure. Bare electric lightbulbs on long wires were fitted throughout the Scottish Section and hung to the line of the picture rails. According to the Studio, these were not lit, but served to emphasise the upper spatial boundary. Long, narrow banners stencilled with attenuated female forms and roses were hung at the thresholds between the rooms. The English-language reviews of the Scottish Section repeatedly highlighted Mackintosh's overall control of its design, the significant contribution made by female designers, and the consistently austere and simple style of work presented by the chiefly Glasgow-based designers. They also analysed the exhibits in some detail. Interestingly, in contrast to the other international exhibitions in which Mackintosh participated, the British architectural as well as the decorative arts press took notice of the Turin exhibition. From the first, the architect decided that three rooms without any exhibits should be in and for themselves matter for exhibition. Containing nothing, they yet should be material for study, and the exhibits, should be added enrichments, and should by treatment fall into the general scheme. The spectator on entering was to be struck by the fact that here was something novel and complete in its general ensemble, and was to be insensibly led on to examine in detail the work of its parts and the matter exposed for exhibition. Reviews in German-language decorative arts journals simultaneously praised and expressed deep-rooted scepticism about the Scottish Section as a whole and the Mackintoshes' work in particular. French reviews also acknowledged the distinctive style of the simple and harmonious Scottish Section, and praised the textile work, but expressed reservations over the practicality and comfort of Mackintosh's furniture. 1: Richard A. Etlin, 'Turin 1902: The Search for a Modern Italian Architecture', Journal of Decorative and Propaganda Arts, 13, Summer 1989, p. 98; Leopold Gmelin, 'Die I. internationale Ausstellung für moderne dekorative Kunst in Turin 1902', Kunst und Handwerk, 52, 1902, p. 298; 'Notes of the General Commission of the International Exhibition of Modern Decorative Art', in Rossana Bossaglia, Ezio Godoli and Marco Rossi, Torino 1902: Le Arti Decorative Internazionali del Nuovo Secolo, Milan: Fabbri Editori, 1994, pp. 36–7, translated by Elena Trimarchi. 2: 'Turin Decorative Art Exhibition', Glasgow Herald, 27 February 1902, p. 7. 3: Juliet Kinchin and Pamela Robertson, 'La Sezione Scozzese', in Rossana Bossaglia, Ezio Godoli and Marco Rossi, Torino 1902: Le Arti Decorative Internazionali del Nuovo Secolo, Milan: Fabbri Editori, 1994, p. 532. 4: 'Turin Decorative Art Exhibition', Glasgow Herald, 27 February 1902, p. 7; Juliet Kinchin and Pamela Robertson, 'La Sezione Scozzese', in Rossana Bossaglia, Ezio Godoli and Marco Rossi, Torino 1902: Le Arti Decorative Internazionali del Nuovo Secolo, Milan: Fabbri Editori, 1994, p. 536. The newspaper article states that Edinburgh embroidery and mural artist Phoebe Traquair would submit work and Glasgow architects Salmon & Gillespie would have their own room. However their participation was not realised, though a combined electric fireplace and clock in brass by Gillespie was exhibited. See Georg Fuchs, 'Mackintosh und die Schule von Glasgow in Turin', Deutsche Kunst und Dekoration, 10, 1902, p. 576. 6: 'Turin Exhibition', Glasgow Herald, 10 May 1902, p. 3; Glasgow School of Art Archive: letter from Francis H. Newbery to exhibition executive committee and balance sheets, April 1903. 7: Berlin, Werkbundarchiv, Museum der Dinge: Hermann Muthesius Estate, letter from Charles Rennie Mackintosh to Hermann Muthesius, 16 April 1900. 8: Letter from Joseph Maria Olbrich to Claire Morawe, 2 May 1902 (Private Collection), quoted by Robert Judson Clark, 'Olbrich and Mackintosh', in Patrick Nuttgens, Mackintosh and his Contemporaries in Europe and America, London: John Murray, 1988, p. 106; originally quoted in Joseph August Lux, Joseph M. Olbrich: Eine Monographie, Berlin, 1919, p. 91. 9: Richard A. Etlin, 'Turin 1902: The Search for a Modern Italian Architecture', Journal of Decorative and Propaganda Arts, 13, Summer 1989, pp. 98–9; Universität für angewandte Kunst Wien, Kunstsammlung und Archiv, letter from Fritz Waerndorfer to Josef Hoffmann, 29 April 1902, Inv. Nr. 3997; Ezio Godoli, ' "Uno stile uniforme, che non è altro che lo stile austro-tedesco". Polemiche sull'architettura dell'esposizione', in Rossana Bossaglia, Ezio Godoli and Marco Rossi, Torino 1902: Le Arti Decorative Internazionali del Nuovo Secolo, Milan: Fabbri Editori, 1994, pp. 63–75, translated by Elena Trimarchi. 10: See section 'B' on official map in Riccardo Spigliati, Guida della prima Esposizione internazionale d'Arte Decorativa moderna, Turin: Matteo Artale, 1902. 11: 'The First Exhibition of Modern Decorative Art at Turin – The Scottish Section', Studio, 26, 1902, p. 93; Juliet Kinchin and Pamela Robertson, 'La Sezione Scozzese', in Rossana Bossaglia, Ezio Godoli and Marco Rossi, Torino 1902: Le Arti Decorative Internazionali del Nuovo Secolo, Milan: Fabbri Editori, 1994, p. 532. 12: 'The First Exhibition of Modern Decorative Art at Turin – The Scottish Section', Studio, 26, 1902, p. 93; Juliet Kinchin and Pamela Robertson, 'La Sezione Scozzese', in Rossana Bossaglia, Ezio Godoli and Marco Rossi, Torino 1902: Le Arti Decorative Internazionali del Nuovo Secolo, Milan: Fabbri Editori, 1994, p. 533. 14: Riccardo Spigliati, Guida della prima Esposizione internazionale d'Arte Decorativa moderna, Turin: Matteo Artale, 1902, p. 41. 15: Glasgow School of Art archive: letter from Francis H. Newbery to exhibition executive committee, and balance sheets, April 1903. 16: Mackintosh's salary in 1902 was £248 9s 9d (£20 per month plus an additional £8 9s 9d in expenses). The Hunterian, University of Glasgow: Turin exhibition research notes; The Hunterian, University of Glasgow: John Honeyman & Keppie / Honeyman, Keppie & Mackintosh / Keppie Henderson cash book, 1889–1917, GLAHA 53079, pp. 71–5. 17: Report of the Exhibition Jury, pp. 135–7. Translated in 1992 by Dennis Mooney, University of Glasgow department of Italian. 18: L'Exposition internationale des arts décoratifs modernes à Turin, Darmstadt: Alexander Koch, 1902. 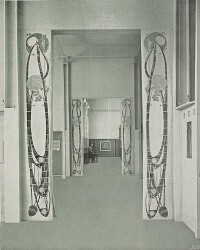 Koch's publishing house was represented in Turin by a room designed by Peter Behrens, in the Hessen Section of the German exhibition. See Rossana Bossaglia, Ezio Godoli and Marco Rossi, Torino 1902: Le Arti Decorative Internazionali del Nuovo Secolo, Milan: Fabbri Editori, 1994, pp. 305–8. 19: 'The First Exhibition of Modern Decorative Art at Turin – The Scottish Section', Studio, 26, 1902, p. 93. 20: Walter Crane, 'Decorative Art at Turin', Art Journal, 1902, pp. 261–2. 21: Alfredo Melani, 'L'Art Nouveau at Turin', Architectural Record, 1902, pp. 739–40; Richard A. Etlin, 'Turin 1902: The Search for a Modern Italian Architecture', Journal of Decorative and Propaganda Arts, 13, Summer 1989, pp. 96–7. 22: William Scott, 'The First International Exhibition of Modern Decorative Art, Turin, 1902', Journal of the Royal Institute of British Architects, 9, 27 September 1902, p. 488. 23: 'Kritische Umschau', Innendekoration, 13, 1902, p. 230; Georg Fuchs, 'Mackintosh und die Schule von Glasgow in Turin', Deutsche Kunst und Dekoration, 10, 1902, p. 578. 24: W. Fred, 'Die Turiner Ausstellung', Dekorative Kunst, 5, 1902, p. 402. 25: Anna L. Plehn, 'Erste internationale Ausstellung für moderne dekorative Kunst in Turin', Kunstgewerbeblatt, 14, 1903, p. 6. 26: Leopold Gmelin, 'Die I. internationale Ausstellung für moderne dekorative Kunst in Turin 1902', Kunst und Handwerk, 52, 1902, pp. 299, 315–16. 27: Friedrich Ahlers-Hestermann, Stilwende: Aufbruch der Jugend um 1900, Berlin: Gebrüder Mann, 1956 (2nd edn); Alan Crawford, Charles Rennie Mackintosh, London: Thames & Hudson, 1995, pp. 97–8. 28: Report of the Exhibition Jury, p. 137. Translated in 1992 by Dennis Mooney, University of Glasgow department of Italian. 29: The Hunterian, University of Glasgow: Turin exhibition research file, notes from Alfredo Melani. 'Di fronda in fronda, Luce e Arte', Arte e Storia, 21, 1 October 1902, reproduced in Francesca Frantini, Torino 1902. Polemiche in Italia sull'Arte Nuova, Turin: Martano Editore, 1970, p. 220. 30: The Hunterian, University of Glasgow: Turin exhibition research file, English notes from Leonardo Bistolfi, 'L'Arte decorativa moderna', conference announcement, L'Arte decorativa moderna, 1, May 1902, reproduced in Francesca Frantini, Torino 1902. Polemiche in Italia sull'Arte Nuova, Turin: Martano Editore, 1970, pp. 219–20. 31: Ugo Ojetti, 'L'Arte Nuova a Torino', Corriere della Sera (Milan), 20–1 June 1902, reproduced in Francesca Frantini, Torino 1902. Polemiche in Italia sull'Arte Nuova, Turin: Martano Editore, 1970, pp. 218–19. Translated in 1992 by Dennis Mooney, University of Glasgow department of Italian. 32: The Hunterian, University of Glasgow: Turin exhibition research file, English notes from M.-P. Verneuil, 'L'Exposition d'Art décoratif moderne à Turin', Art et Décoration, 12, July – December 1902, pp. 86–9; Gustave Soulier, 'L'Exposition internationale d'Art décoratif moderneà Turin', L'Art Décoratif, June 1902, pp. 129–30.